Earlier today, fans of HBO’ Westworld were treated to the premiere of the official Westworld Season Two trailer, which features a new version of the song “Heart-Shaped Box” (originally performed by Nirvana) by multi-Grammy® and Emmy® Award-nominated composer Ramin Djawadi (Westworld, Game of Thrones), now available to stream and for purchase. Full details for the album Westworld Season 2 (Music From The HBO® Series) have yet to be announced. Upon hearing “Heart-Shaped Box,” Westworld fans will be thrilled to hear Djawadi continuing his masterful re-imagining of classic songs as he did in Westworld Season One. 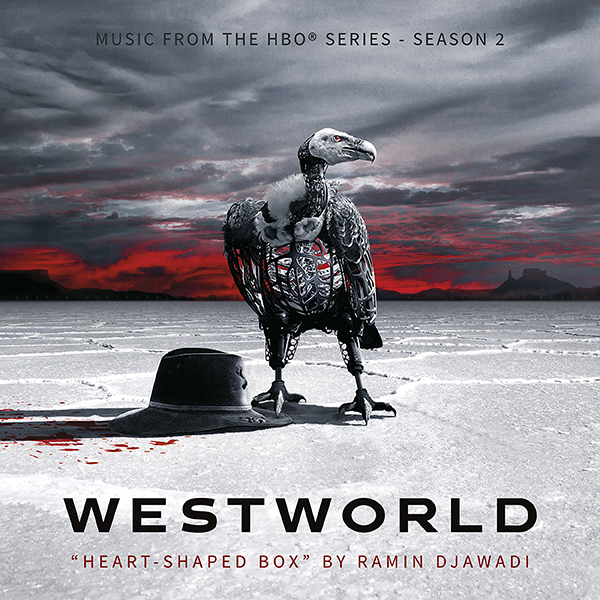 The album, Westworld: Season 1 (Music from the HBO® Series), contained his powerful versions of “Back To Black” (originally performed by Amy Winehouse), “Black Hole Sun” (originally performed by Soundgarden), “Paint It, Black” (originally performed by The Rolling Stones), “A Forest” (originally performed by The Cure), and “No Surprises” (originally performed by Radiohead), among others. Westworld will return to HBO for its second season on Sunday, April 22, 9:00-10:00 p.m. ET/PT. Debuting in 2016 to become HBO’s most-watched freshman series ever, Westworld is a dark odyssey about the dawn of artificial consciousness and the evolution of sin. The season one cast included Anthony Hopkins, Evan Rachel Wood, Thandie Newton, Ed Harris, Jeffrey Wright, James Marsden, Tessa Thompson, Sidse Babett Knudsen, Jimmi Simpson, Rodrigo Santoro, Shannon Woodward, Ingrid Bolsø Berdal, Ben Barnes, Simon Quarterman, Angela Sarafyan, Luke Hemsworth, Clifton Collins, Jr., Talulah Riley and Louis Herthum. Joining the season two cast are series regulars Katja Herbers, Gustaf Skarsgard and Fares Fares. Created for television by Jonathan Nolan and Lisa Joy, who are executive producers with J.J. Abrams, Athena Wickham, Roberto Patino, Richard Lewis and Ben Stephenson. Production companies, Kilter Films and Bad Robot Productions in association with Warner Bros. Television; based on the film written by Michael Crichton. Catch up on all ten Season One episodes of Westworld on HBO NOW, HBO GO, HBO On Demand and partners’ streaming platforms.